Roth IRAs can set your child on a better path for not only financial retirement, but also a Roth IRA for a minor can be an asset to a college savings portfolio. In many ways, it’s much easier to make your child a millionaire than to leave a million dollars to your child. This is a refsult of compounding tax-free growth begun at a very young age. More and more parents are exploring an IRA for minors. When you don’t want to read the fine print of IRS publications, it helps to have all the IRA eligibility rules at your finger tips. The rules for minors are explained in The Kid’s Roth IRA Handbook. The Kid’s Roth IRA Handbook covers every aspect of Roth IRA Information you could possibly need for a child wishing to begin working and open an IRA. Does your child have a copy yet? What Type of Job Can You Do? What about 529 Plans, Bonds, or Other Investments? Who wants to read and interpret IRS Publications? Instead, read the eligibility rules in plain English, in terms even your child can understand. ~ Why not read the book together with your child? See other parent’s thoughts on Roth IRAs for minors below. Excellent Resource for Setting Up Roth IRA for Kids! I have been looking for a way to setup a Roth IRA for my daughters after learning that there was no minimum age a couple years ago. This book gave me the detailed instructions to do it, and to do it within the strict guidelines that the IRS has set. My daughters will thank the author when they have seen their money compounded with a couple DECADES head start compared to their friends! This book was chock FULL of information to help parents and their children understand the ROTH IRA and how it can help your child secure tax-free wealth from their very first paycheck. I wish I had this book three years ago when my daughter first entered the world of working. She finally opened her ROTH IRA last fall. This book is user friendly. It has the technical jargon you may need, but has it presented in a very simple way. I think your teen could pick this book up and read it. If given to a homeschool teen, this would count toward a consumer math credit. It is quite thorough. As a former tax consultant I am financially savvy. This book is a winner! I HIGHLY recommend it. Teaching children about saving money is critical for their success as adults. 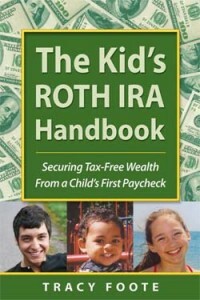 This book provides a step-by-step guide on how to teach your children about investing and specifically Roth IRAs. As an adult who had little knowledge on this subject, I found the book easy to understand without it being condescending. My children have both read this book (16 and 10) and were able to understand it completely. Even though they were resistant at first, both of my girls are now eagerly working on saving enough money to start their own Roth IRAs. This is a well thought out book and should be required reading for all parents and children. It is a great read, and an easy read for any parent teaching their kids about working and what to do with their money. Their is a lot more to it then just saving your money in the bank, and this book does a great job of breaking down the steps of what to do with your money. It even makes suggestions of jobs that children can do, whether it be working for their parents or getting a job outside of the home. My daughter is only 6, but I started teaching her about money and working for her money about a year ago. Of course I did not go into any complicated details, but I felt the younger the better to learn about money and what to do with it. I learned things from this book that I did not know before, so it was not only helpful for me to explain things to my daughter, but it was helpful for me as well, considering I learned some valuable information that I did not know before. I will keep referring back to book as my daughter gets older, and when she is old enough to understand the book on her own, she will read it as well. If only all teens had this book! I try very hard to teach my 17 year old strong money lessons.. he needs a job if he wants to have a car, he has to pay the insuarnce on that car.. the gas, it’s mandatory that he save 1/2 of every paycheck he gets for “emercencys” etc. But i have to admit, i never thought of him starting a Roth IRA. So, I grabbed the book, his W2, printed off a 1040 from the internet.. and told him good luck. Within 30 minutes he had his return ready to go LONG FORM, but even better than that it sparked conversations that will help him immensely in his financial future. Before you know it he has refund deposited into his bank account and he is offically a tax paying citizen! This book is well worth the money and I implore you to enrich your childs financial future with this excellent read. In our tough economy, allowances are being cut and more and more children are looking for employment. On December 15, 2008, Lisa W. Foderaro covered the issue in her New York Times article concerning Teenagers Feel the Crunch which shows how kids across the nation are having to adjust to new economical situations. Lost opportunity can be both financially and emotionally painful. Lost means gone! You can never get it back again. Every year you wait to start a Roth IRA for kids, you lose another opportunity for tax-free compounded earnings and you can never get that opportunity back. Let’s show kids how to maximize the opportunity for tax free compounding interest by teaching them to open a Roth IRA.